John Williams has created a lot of great music in his career, but none of it compares to his work on the Star Wars movies. In fact, we are going to hear more of his music in The Force Awakens. If you enjoy listening to Willam’s Star Wars soundtracks, we have some good news for you. Sony Classical has announced that they will be re-releasing the original soundtracks of all six films in special editions. The Force Awakens’ soundtrack will be released separately. These reissues will be released in three new, definitive editions: Star Wars: The Ultimate Vinyl Collection, Star Wars: The Ultimate Soundtrack Edition, and Star Wars: The Ultimate Digital Collection. All composed by John Williams, of course. Star Wars: The Ultimate Vinyl Collection includes each of the six film soundtracks in deluxe gatefold sleeves that reproduce the original artwork. 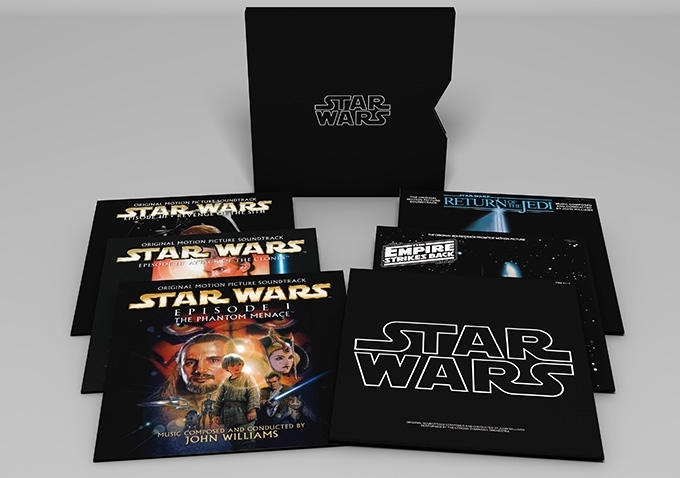 In Star Wars: The Ultimate Soundtrack Edition, you get the original six soundtracks in mini-album jackets, and also has a bonus CD featuring audio interviews with Harrison Ford and John Williams. You also get the DVD Star Wars: A Musical Journey, a one-hour special. There’s also a fold-out poster and three collectible stickers. Star Wars: The Ultimate Digital Collection features the six original soundtracks available as high-definition downloads. These collector’s sets will be released worldwide January 8, 2016. So mark your calendar. And get a decent pair of headphones while you’re at it. This is a great time to fall in love with this music all over again.